Brasilia (Agenzia Fides) – A Portuguese language course is taking place these days for missionaries starting their work of evangelization in Brazil. The course will last 7 weeks and will end on April 17th. The first meeting of the group took place during the Eucharistic celebration presided over by Fr. Jaime Luiz Gusberti, Executive Secretary of the Missionary Cultural Center of the CNBB (Brazilian Bishops' Conference). Among the twenty participants in the course: Fr. George and Fr. 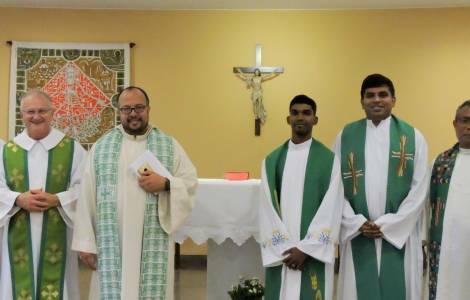 Britto, of the Congregation of the Missionaries of St. Francis de Sales, both from India; Father Hubertus of the Congregation of the Order of the Holy Cross, from Indonesia; Father Sergio, of the Little Work of Divine Providence (Orionini), from Argentina; Father Sam of the Congregation of Claretian Missionaries, from India. According to Father Jaime Gusberti, availability and willingness to learn the language of the place where the missionary is sent should be the first task. "To open up to talk with other people means to be willing to enter in their lives and be part of it", he stressed. In addition to an introduction to the Portuguese language, the course also aims to help the missionaries to get to know the community aspects and to provide some elements related to the cultures of Brazil. The missionaries constitute an extra step for the evangelization of this vast country, which due to its size and its complex reality requires enormous human resources for any ecclesial and social project. The Missionary Action Commission of the CNBB (National Conference of Bishops of Brazil) works together with the Pontifical Mission Societies and the CIMI (Missionary Indigenist Council) in order to ensure the best service and share evangelization with the local Church. The Pontifical Mission Societies, with their commitment to the prophetic proclamation of the Kingdom in the perspective of a "Church that goes forth", are committed in many aspects of the mission, especially alongside the weakest of this vast country, as witnessed by the attached video. OCEANIA/SOLOMON ISLANDS - The Guanellians: "Mission on the Ocean, combining evangelization and human promotion"